Wen, Y., C. Xu, Y. Liu, G. Jiang, and P. He (2013), Coseismic slip in the 2010 Yushu earthquake (China), constrained by wide-swath and strip-map InSAR, Nat. Hazards Earth Syst. Sci., 13(1), 35-44, doi:10.5194/nhess-13-35-2013. Jiang, G., C. Xu, Y. Wen, Y. Liu, Z. Yin, and J. Wang (2013), Inversion for coseismic slip distribution of the 2010 Mw 6.9 Yushu Earthquake from InSAR data using angular dislocations, Geophysical Journal International, 194(2): 1011-1022. 王乐洋, 许才军, 温扬茂 (2013), 利用STLN和InSAR数据反演2008年青海大柴旦Mw 6.3级地震断层参数, 测绘学报, 42(2), 168-176. 丁开华, 许才军, 温扬茂 (2013), 汶川地震震后形变的GPS反演, 武汉大学学报(信息科学版), 38(02), 131-135. 李志才, 张鹏, 温扬茂, 廖瑛 (2013), 利用GPS和海底基准点观测形变反演日本大地震(Mw 9.0)同震断层滑动分布, 武汉大学学报(信息科学版), 38(01), 40-43. Wen, Y., Z. Li, C. Xu, I. Ryder, and R. Bürgmann (2012), Postseismic motion after the 2001 MW 7.8 Kokoxili earthquake in Tibet observed by InSAR time series, J. Geophys. Res., 117(B8), B08405, doi:10.1029/2011JB009043. Liu, Y., C. Xu, Y. Wen, P. He, and G. Jiang (2012), Fault rupture model of the 2008 Dangxiong (Tibet, China) Mw 6.3 earthquake from Envisat and ALOS data, Advances in Space Research, 50(7), 952-962, doi:10.1016/j.asr.2012.06.006. 温扬茂, 何平, 许才军, 刘洋 (2012), 联合Envisat和ALOS卫星影像确定L′Aquila地震震源机制, 地球物理学报, 55(01), 53-65. 温扬茂, 许才军, 刘洋,何平 (2012), 利用断层自动剖分技术的2008年青海大柴旦Mw6.3级地震InSAR反演研究, 武汉大学学报(信息科学版), 37(04), 458-462+507. 何平, 温扬茂, 许才军, 李志才 (2012), 用多时相InSAR技术研究廊坊地区地下水体积变化, 武汉大学学报(信息科学版), 37(10), 1181-1185. 许才军, 何平, 温扬茂, 杨永林 (2012), 利用CR-InSAR技术研究鲜水河断层地壳形变, 武汉大学学报(信息科学版), 37(03), 302-305. 许才军, 何平, 温扬茂, 张磊 (2012), 日本2011 Tohoku-Oki Mw 9.0级地震的同震形变及其滑动分布反演:GPS和InSAR约束, 武汉大学学报(信息科学版), 37(12), 1387-1391+1384. 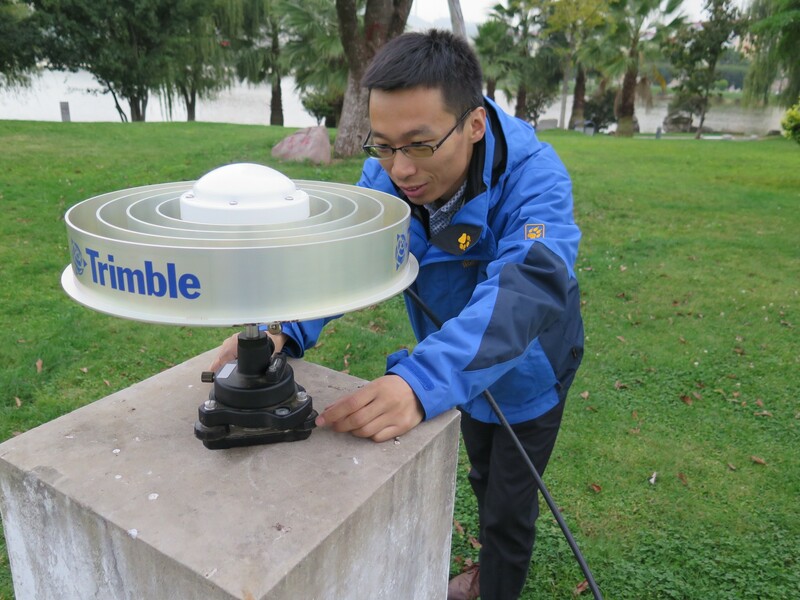 许才军, 江国焰, 汪建军, 温扬茂 (2012), 基于GNSS/InSAR/GIS的活动断层地震危险性评估系统, 测绘学报, 41(05), 661-669. Xu, C. J., L. Y. Wang, Y. M. Wen, and J. J. Wang (2011), Strain Rates in the Sichuan-Yunnan Region Based upon the Total Least Squares Heterogeneous Strain Model from GPS Data, Terrestrial Atmospheric and Oceanic Sciences, 22(2), 133-147, doi:10.3319/TAO.2010.07.26.02(TibXS). Liu, Y., C. Xu, Z. Li, Y. Wen, and D. Forrest (2011), Interseismic slip rate of the Garze–Yushu fault belt in the Tibetan Plateau from C-band InSAR observations between 2003 and 2010, Advances in Space Research, 48(12), 2005-2015, doi:10.1016/j.asr.2011.08.020. Shan, B., X. Xiong, Y. Zheng, S. Wei, Y. Wen, B. Jin, and C. Ge (2011), The co-seismic Coulomb stress change and expected seismicity rate caused by 14 April 2010 Ms=7.1 Yushu, China, earthquake, Tectonophysics, 510(3-4), 345-353, doi:10.1016/j.tecto.2011.08.003. 许才军, 何平, 温扬茂 (2011), 利用PSInSAR研究意大利Etna火山的地表形变, 武汉大学学报(信息科学版), 36(09), 1012-1016. 江国焰, 许才军, 李明峰, 温扬茂 (2011), 利用两种z变换算法的PS-DInSAR相位解缠与等价性证明, 武汉大学学报(信息科学版), 36(03), 338-341. 许才军, 江国焰, 王浩, 温扬茂 (2011), 基于GIS的InSAR结果分析方法及在汶川Mw7.9级地震同震解释中的应用, 武汉大学学报(信息科学版), 36(04), 379-383+376+507. Xu, C., Y. Liu, Y. Wen, and R. Wang (2010), Coseismic Slip Distribution of the 2008 Mw 7.9 Wenchuan Earthquake from Joint Inversion of GPS and InSAR Data, Bulletin of the Seismological Society of America, 100(5B), 2736-2749, doi:10.1785/0120090253. 许才军, 林敦灵, 温扬茂 (2010), 利用InSAR数据的汶川地震形变场提取及分析, 武汉大学学报(信息科学版), 35(10), 1138-1142+1261-1262. Wen, Y. M., and C. J. Xu (2009), Static Stress Change from the 8 November, 1997 Ms 7.9 Manyi, Tibet Earthquake as Inferred from InSAR Observation, in Observing Our Changing Earth, edited by M. G. Sideris, pp. 793-801. Wu, J., C. Xu, Y. Wen, and F. Xiao (2009), Experimental PALSAR interferometry in Shanghai for ground subsidence monitoring, paper presented at ALOS PI 2008 Symposium, November 3, 2008 – November 7, 2008, European Space Agency, Island of Rhodes, Greece. 温扬茂, 许才军 (2009), 基于敏感度的迭代拟合法反演玛尼Ms7.9级地震滑动分布, 武汉大学学报(信息科学版), 34(06), 732-735. 温扬茂, 许才军 (2009), 联合GPS与重力资料反演分析川滇地区现今地壳形变, 武汉大学学报(信息科学版), 34(05), 568-572. 许才军, 刘洋, 温扬茂 (2009), 利用GPS资料反演汶川Mw 7.9级地震滑动分布, 测绘学报, 38(03), 195-201+215. 许才军, 汪建军, 温扬茂 (2009), 震后松弛过程的粘弹性模型在1997年Mw7.6玛尼地震中的应用研究, 武汉大学学报(信息科学版), 34(03), 253-256+250. 李志才, 张鹏, 金双根, 蒋志浩, 温扬茂 (2009), 基于GPS观测数据的汶川地震断层形变反演分析, 测绘学报, 38(02), 108-113+119. 许才军, 温扬茂 (2008), 基于InSAR数据的西藏玛尼Ms7.9级地震的地壳不均匀性研究, 武汉大学学报(信息科学版), 33(08), 846-849. 李志才, 许才军, 张鹏, 温扬茂 (2008), 基于地壳分层的地震断层同震变形反演分析, 武汉大学学报(信息科学版), 33(03), 229-232. Xu, C., and Y. Wen (2007), Identification and analysis of crustal motion and deformation models in the Sichuan-Yunnan region, JOURNAL OF APPLIED GEODESY, 1(4), 213-222. 李志才, 许才军, 赵少荣, 温扬茂 (2006), 基于地壳分层的震后变形分析, 武汉大学学报(信息科学版), 31(03), 203-208. 许才军, 温扬茂 (2003), 活动地块运动和应变模型辨识, 大地测量与地球动力学, 23(03), 50-55.